22 | June | 2009 | Azazel's Bitz Box. Here I have added more basecoating to the face, arms and bangles as well as some drybrushing of the sand around the rocks. Painting the base rim always makes a figure look neater. 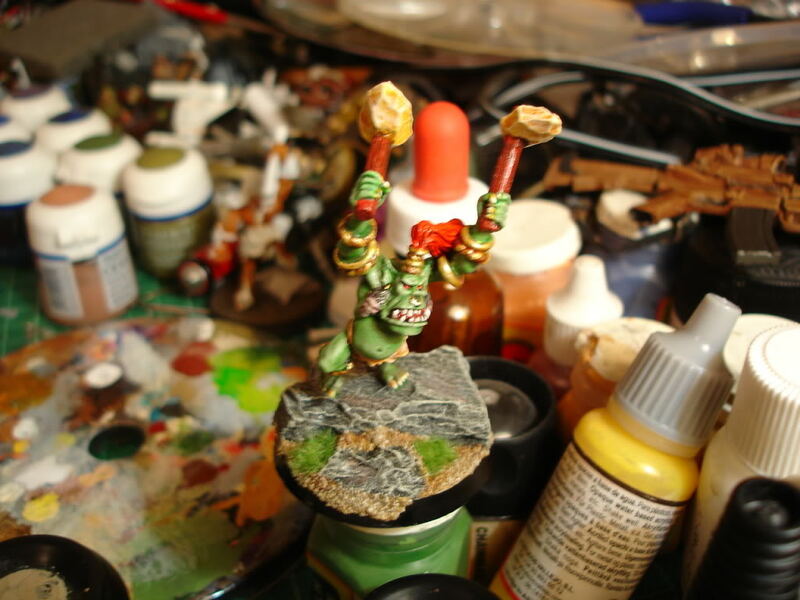 Blurry pic – work done on the face, teeth, bangles, hair. At this point I wasn’t sure if I’d use the existing warpaint (in the end I didn’t). The rest of the skin re-base coated, base coats on the hammerheads. More work on fingernails, bangles, other little details. Shading of flesh. Lots of other stuff close to finished. A final bit of shading and highlighting, some static flock to add some colour to the base, and we’re Finished! 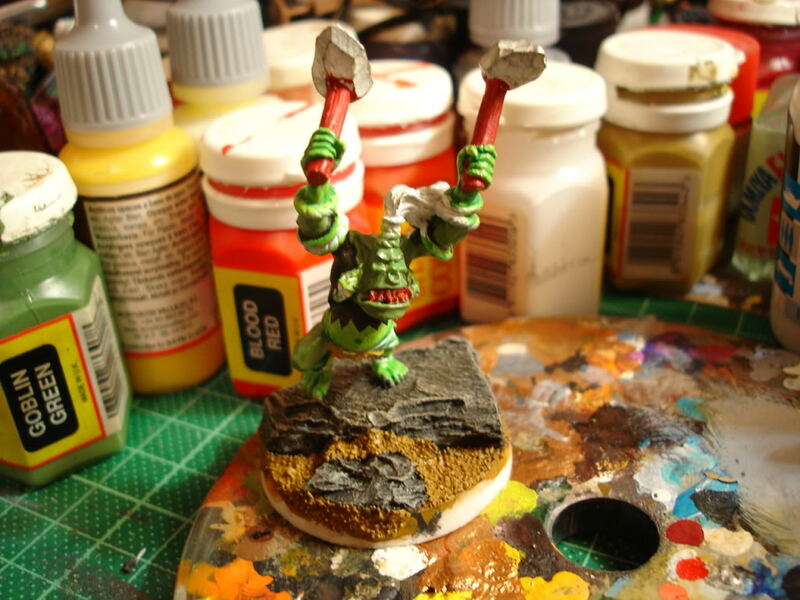 So that’s the process of painting an orc. Exciting, eh? 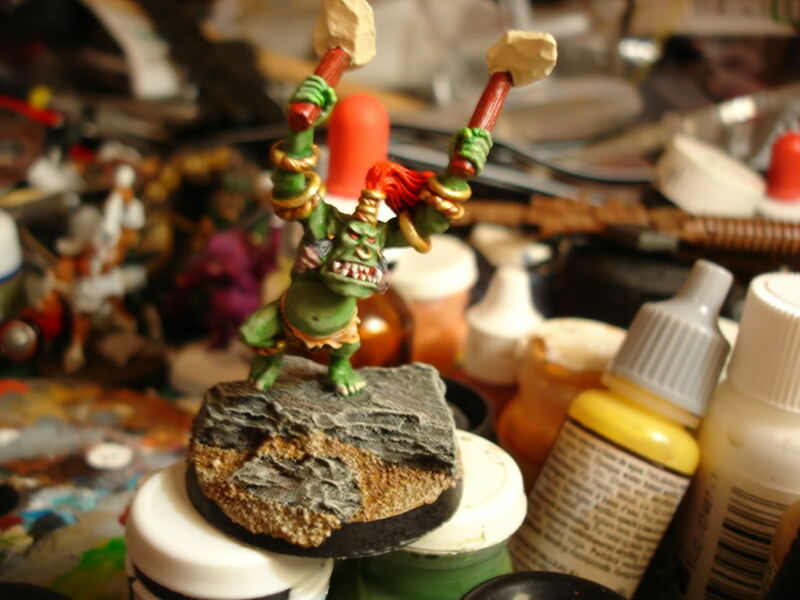 So anyway, what inspired me to start this thing specifically was a thread on f13 about miniatures, specifically IainC’s posts of his Daemon army with links to his blog for the piccies. 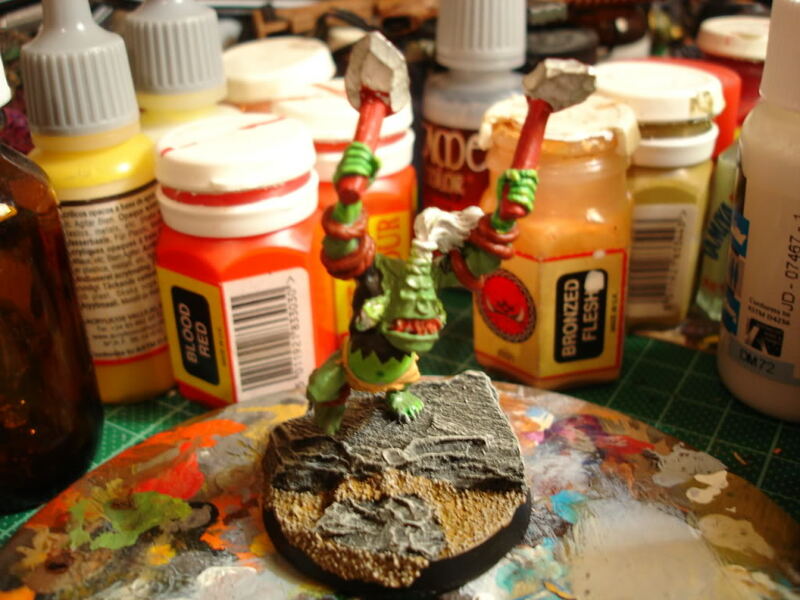 To start with, a series of WIP shots showing the progression of a figure. It was only the second figure I’d painted in a couple of years, for a charity auction at work for the Victorian Bushfire Relief, for the fires of Feb 2009. Anyway, the process of painting this figure was enjoyable, and got me interested in painting again, so I’ll be posting more stuff over time. 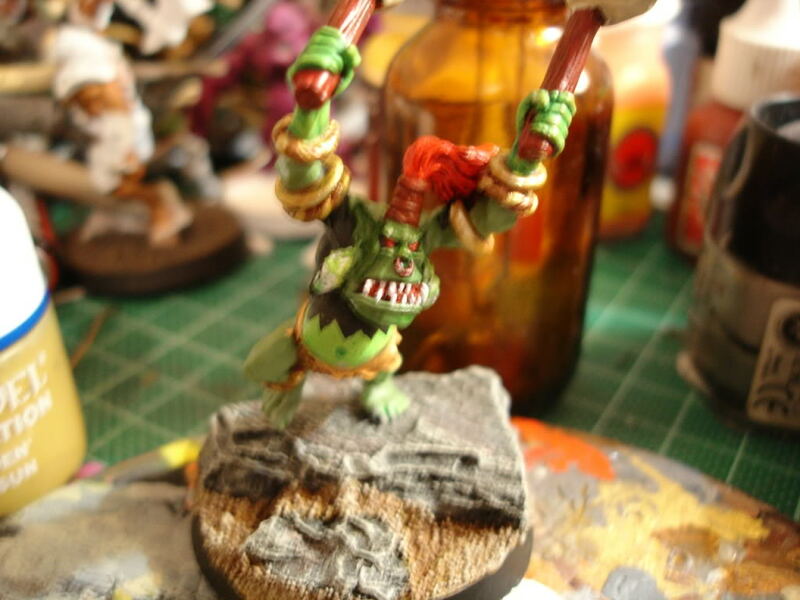 The figure itself is a Savage Orc Champion, from Games Workshop. 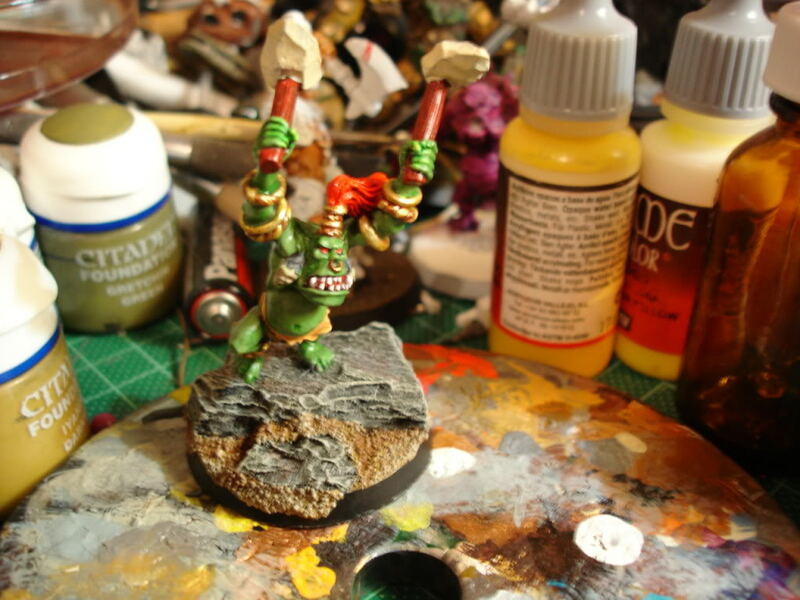 The figure is about 10 years old, which I aquired from a friend when he sold off his Orc army to me, which I then never got around to doing anything with. Jared had started to paint the flesh, but I preferred to do a complete repaint in my own style. 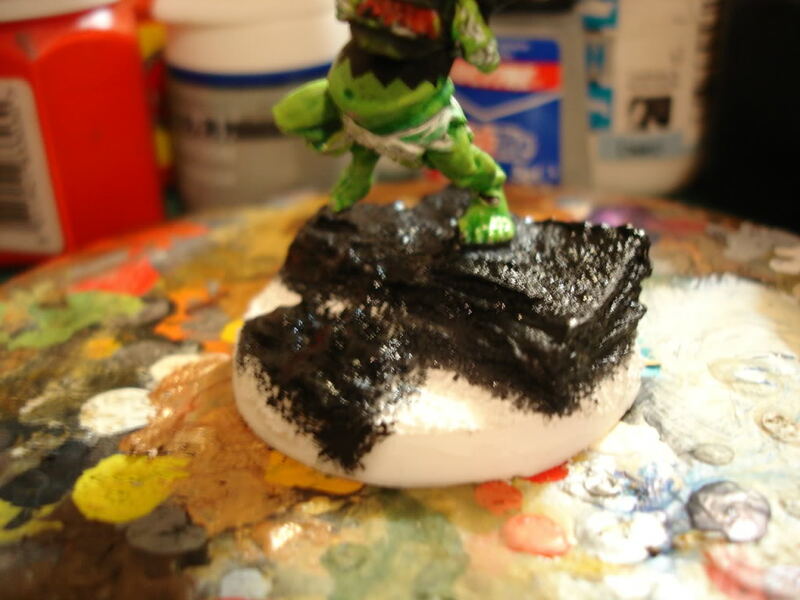 Since this was to be a display figure, I mounted it on a 40mm round resin display base from Back To Base-IX. 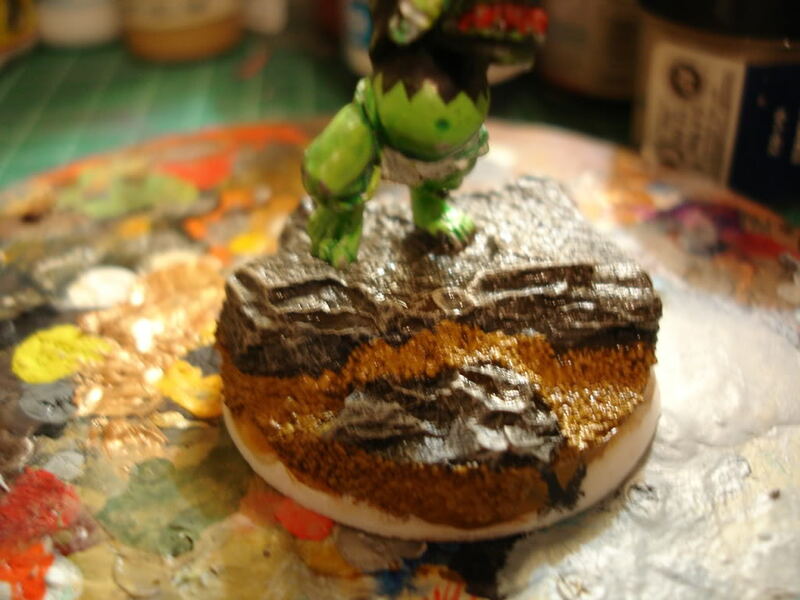 To start with, I just removed the tab from the Orc and mounted him to the base with some brass rod. 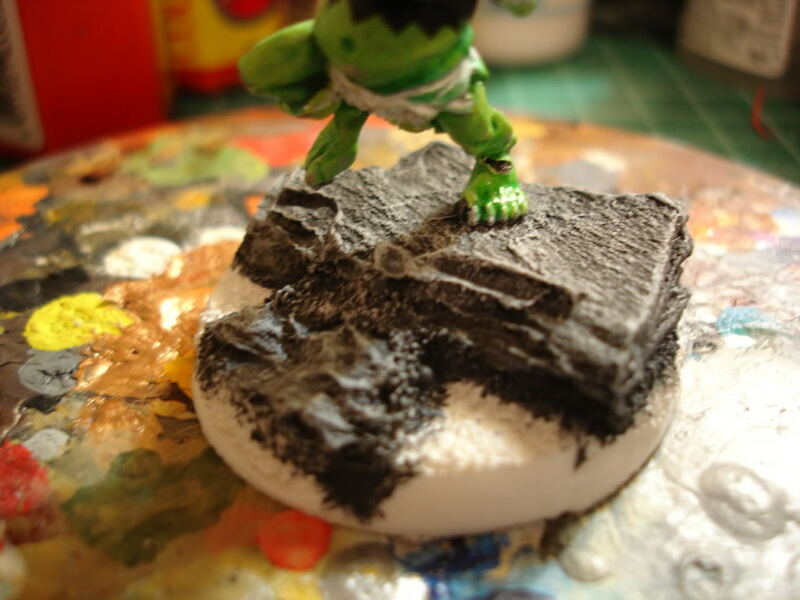 A mix of black and very dark grey onto the rocky section of the base. A couple of layers of drybrushing on the rocks. 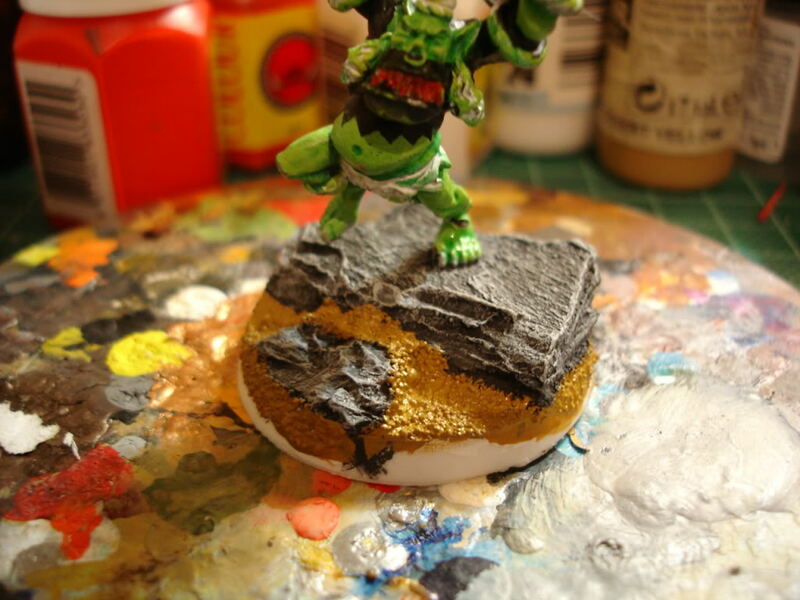 And a basecoat for the sand around the rocks. Basecoat for some of the skin and the rosewood-style club handles. So.. after several years of ignoring them and being somewhat annoyed by them, I’m starting my first blog. 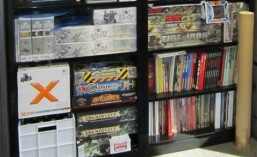 It’s pretty much just the new version of “welcome to my homepage” and “here are some photos of my cats”, but I figure it can’t hurt to have somewhere on the intertubes to show some photos of my miniatures and other creative projects, occasionally ramble on about videogames, or other useless crap on occasion, link to cool stuff, etc. Oh, and post photos of my cat.